If life begins at 40 then long distance triathlon specialist Sarah Crowley has an exciting five years to prepare for the best years of her life after a 2017 that ticked some big boxes. The 35-year-old professional triathlete has been competing around the world for the past decade in what has already been a celebrated career – one that keep’s getting better with age after her dynamic third place finish at the Ironman World Championship in Kona last year. It was a culmination of a season that saw her win the 2017 ITU Long Distance World Championship – one of the many highlights of the 2017 Multi-Sport World Championships in Penticton. The Brisbane-based Crowley will again spearhead a star-studded Australian team named for this year’s Championships in Fyn, Denmark from July 6-14. 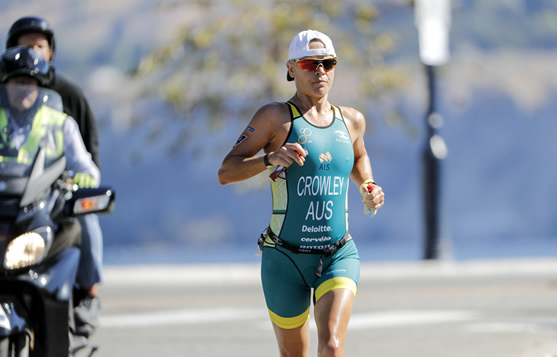 Crowley will be joined on the Elite Long Course team by 2017 Ironman Texas winner and three-time Ironman 70.3 World Champion Melissa Hauschildt, Dimity-Lee Duke, former ITU world beater from the early 2000s who has forged a career over the long distance format Annabel Luxford in the women’s field. Ironman champion and recent silver medallist at Ironman South Africa Josh Amberger will lead the charge in the men’s field, along with 70.3 specialist Sam Betten. Amberger finished second in Penticton ITU Long Distance World Championships and is back for a medal of a different colour in Denmark. The former Adelaide triathlete and 2014 National Duathlon Champion will also join Hauschildt (also a two-time Queensland Duathlon Champion) and former ITU World Duathlon Champion and defending champion, WA’s Felicity Sheedy-Ryan – in both the Elite Aquathlon and Duathlon. 35-year-old Hauschildt has been in scintillating recent form, adding 2018 Ironman Texas to her recent string of wins in Galveston and Port Taurganga in New Zealand, with the Texas win making her the first athlete to win three different Ironman Regional Championships - European, Asia-Pacific and now North America. Sheedy-Ryan will also line up in the Cross Tri Division alongside 2012 Olympic bronze medallist Erin Densham while in the men Australian champion Ben Ellen will line up in the Duathlon and the Cross Tri events. Allen finished fourth in the Cross Tri in Penticton after his fifth place finish in the 2016 ITU World Cross Triathlon event in the Snowy Mountains. The Australian team also fields a strong group of Under 23 and Junior athletes - including defending World Cross Tri Junior champion Alec Davison who will also contest the Aquathon and defending Under 23 Aquathon and Cross Tri champion Penny Slater. Albury’s Justin Godfrey, one of Australia’s true all-round Paratriathletes has also been named on the team after his 2016 Para Cross Tri World title he claimed in the Snowy Mountains.